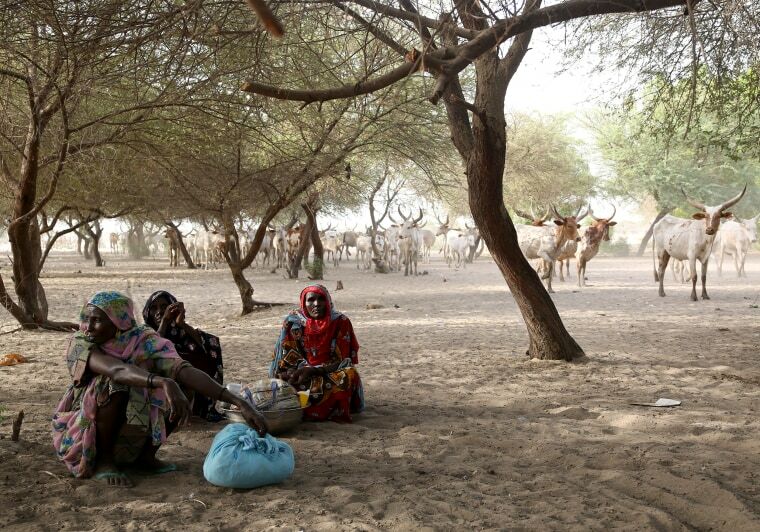 KOULFOUA, Chad — The sounds of gunfire broke out before dawn, waking Zara as she slept. Boko Haram fighters were attacking her village. “They came into the town shooting guns. They slaughtered people,” Zara said. Her son, Younoussa, was in the street when the ISIS-affiliated fighters arrived. Zara said she had no choice but to run — joining an exodus from the fishing town of Baga fleeing Nigeria by rickety canoe for the relative safety of neighboring Chad. Some local officials allege up to 2,000 people were killed there in the January attack by militants who torched buildings and murdered civilians, forcing Zara to flee. After several days Zara made it to the Koulfoua, one of the many islands dotting the vast expanse of water. While she escaped with her life, her troubles were far from over. Zara and thousands of other refugees have been camped on this island in Lake Chad for months — and more terrified people keep coming amid Boko Haram’s campaign of terror. The group was behind the mass kidnapping of more than 300 schoolgirls last year in Nigeria which triggered the #BringBackOurGirls campaign. In recent weeks, it has mounted two attacks on other islands. Boko Haram violence has driven more than 18,000 refugees into Chad — most traveling with nothing but the clothes on their backs, many torn from their families amid the chaos of flight. While 5,000 refugees are being housed in an official U.N. refugee camp further north, the island of Koulfoua has been ill-equipped to deal with a recent influx of the desperate and displaced. Before the Baga attack, this stretch of shoreline was empty. Now it is filled with makeshift huts and compounds, thrown up in haste by new arrivals forced to drink directly from the brownish lake and fish for survival. Authorities said they have tried to accommodate the refugees as best they can, but the burden became too great. The refugees come “by foot, by boat. They are coming all the time,” he said. They lack food, medicine and potable water. The first international aid reached the island this week, and NBC News accompanied the multi-agency mission to assess the refugees' needs. Precious Ajoshua has been sleeping in a rough shelter along the shore of Lake Chad since she fled Doron Baga, just a few miles away from where Zara’s son was slain by Boko Haram. There was no warning that militants were coming to her village, Ajoshua said. She was cooking for her family when she heard gunshots. Terrified, she ran — not even taking the time to put on shoes or grab any belongings. One of the villagers gunned down was a man she knew named Awali. Ajoshua, 23, said she did not know the others who were slain — but many people died. “They killed so many people,” she said, her eyes shifting away. "So many women and ladies have been captured." “We were too shocked to cry — we didn’t have time to cry until it was over,” she added. She described spending three days in the bush with "many others" and no food before deciding to venture out. When she tried to return home, there was nothing there. Finding her home destroyed, Ajoshua took a two-day journey by canoe to Koulfoua with others from her village. While she is grateful to have survived, she insisted that “life is bad” on the island. Ajoshua was among hundreds hours later pushing forcefully against a thin chain-link fence separating a desperate crowd from much-needed assistance. Hands outstretched, the refugees and the displaced shouted and clamored to be let through the gate. As desperation mounted, they pushed and shoved, nearly tearing down the barrier separating them from the aid distribution. Like Ajoshua, most had escaped with little other than their lives when Boko Haram targeted their villages. Armed police guarded the gate, letting women in one by one as those still behind the fence tried to pass infants over it to the aid workers. World Food Programme officials recorded names and ages, then delicately wrapped measuring tapes around childrens’ arms to check for malnutrition. The scenes underscored the grave needs of those on the island, according to Dr. Claude Ngabu. “They are desperate,” explained the chief of UNICEF's field office for the Lake Chad region. “This is the first aid they have had since they came." The agencies said that 900 aid packages were handed out — soap, buckets, medicine and water purification tablets — and 140 malnourished children were documented and given therapeutic food rations. To many, though, it would not be enough. Adam Mohammad fled from Niger once Boko Haram launched a cross-border attack on his country, making a six-day journey to Koulfoua. Fati Abubakar, too, said she needs help to care for her family after fleeing Doron Baga five months ago. “We came out without anything. If you stay to take your property they would kill you,” she said as her youngest child, 17-month-old Lafira, slept on her back. Lafira is too young to remember her father — who Abubakar has not seen since he went back to check on their home shortly after fleeing the attack. Abubakar Garba was also in need, with nothing to do but think about his brush with the militants. The 20-year-old always wanted to be a doctor but, after finishing Islamic school, became a trader to help support his parents and nine brothers and sisters. He was selling cigarettes around three months ago when around 10 Boko Haram fighters entered his village with guns. The fighters asked about his wares, Garba said. “They asked me to lie down, tied my hands and told me they were going to slaughter me,” he said softly. His crime? Selling cigarettes. Garba said he begged for forgiveness or a lesser punishment — but the fighters ignored his pleas. It was only when the fighters’ commander intervened — saying death was too severe a punishment for the offense — that Garba was spared. His new punishment — 80 lashes with a cane — came as a relief, Garba said. He recalled how the militants said nothing as they delivered the brutal punishment, then left without saying a word. Rolling up his sleeves, Garba pointed to the scars from where the ropes cut his wrists and where the cane came down on his arms as he raised them to protect his back from the blows. After the attack, Garba said, his parents told him the “next time when they come here they will kill you.” His family fled the next day, journeying for two days by boat to Koulfoua. “I am so angry because if I can get any opportunity of revenging for what happened to me I will do it,” the soft-spoken Garba said.